Going solar is the way forward and if you have decided to make the switch, then give yourself a pat on your back. Solar energy is one of the best forms of renewable energy that can be used for both home and off-grid purposes. Using renewable sources is the way to keep yourself prepared for the future and with many ready-made options available in the market today, a home solar power system can easily be set up in no time. Solar panels not only provide clean energy, but they also give you peace of mind with their quiet operation, unlike noisy generators. Many first time users who are apprehensive about solar power system cost realize that the initial setup cost can be easily recovered over time. You will be happy to see a considerable reduction in your utility bill every month. In this guide, we give you a list of the best solar panels for home use which are also budget-friendly. Solar panels and solar kits can be quite an expensive investment and so finding a quality brand that will give your years of trouble-free service is important. Factors such as solar rating, durability, cost and installation have to be considered as they need to last many years. They should also be efficient enough and be able to produce power even under overcast weather conditions. The market is flooded with many solar options for your home and can leave a beginner solar energy enthusiast feeling confused. We have handpicked five of the best solar panels for your home to help you make the right decision and let you enjoy the benefits of solar-derived power. Ideal daily output: 2KWh (depending on the availability of sunlight). 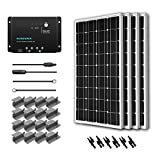 Basic components for off-grid solar panel system, caravan, RV, boat, Green house solar panel system. Easy installation with pre-drilled hole. Each solar panel comes with 90cm 12awg cable with MC4 Male/Female quick connectors. Waterproof IP-65 Rated Junction Box: Advanced water and dust proof level (complete protection against environmental particles and low pressure water jets). Corrosion-resistant aluminum frame for extended outdoor use, allowing the panels to last for decades as well as withstand high winds (2400Pa) and snow loads (5400Pa), Lightweight anodized aluminum frame and reinforced Safety and anti-Reflection coated glass 3.2mm thick (tempered + patterned). The Eco-Worthy solar panel kit is your answer if you want to have an off-grid back-up for your home. This home solar system kit comes ready with everything you need for installation so that you can have it up and running in no time. What’s more, it can also be used to power off-grid cabin houses, caravans, RVs, boars or even your green houses. Easy to install as it comes with connectors, solar panels, an LCD charge controller, a solar cable adapter and bracket mounts. Light-weight and corrosion-resistant aluminum frame for long-lasting performance. Bundle and save! Purchase all the components together and save time and money! Perfect kit for a off-grid 12 volt battery system. 1500 Watt VertaMax Inverter provides plenty of AC power to run your household appliances! Get clean energy for your home with the Windy Nation solar panel kit that comes complete with a 1500 Watt power inverter and a 12 V battery. Now you’ll have the perfect power back-up solution for your home or you can even use it to power your RV, cabins or boats. Grade A solar cells; Heavy duty anodized aluminum frame, 5 year warranty on parts and labor, 25 year power warranty. If you are looking for a ready to use solar panel for your home, the Windy Nation 100 Watt solar panel is a great option. It can be used as a starter panel to simply reduce your utility bill and is also powerful enough to be used in cabins and campervans. A solar starter kit such as the Renogy 400 Watt kit is the best way to get into using solar energy as an alternate power source for your home or other off-grid power requirements such as cabins, RVs and trailers. The charge controller has been upgraded to Renogy' s new 30A PWM Negative Ground Charge Controller -- the Renogy Wanderer. 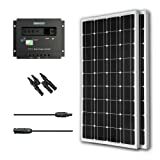 The Renogy 200 Watts solar bundle kit is not only a perfect solution to reduce your utility bills at home, but is also a great kit for campers as it has been designed for use in RVs. You also get to save your money when you buy a bundle kit as buying individual solar panels can be expensive. No matter which of these solar panels you decide to buy and install in your home, you can be assured that your utility bill will see a considerable reduction in charges and you will recover the initial cost in a few years time and enjoy free power afterwards. We have given you some of the best options with unbelievable price tags that they give do it yourself solar panel kits, a run for their money. You can also be happy that you are doing your bit to keep the environment pollution free and noise-free with a reduced carbon footprint.